Our heaviest hit database on the Developer Network is the CodeCentral database, which is currently about 37GB in size. (We have larger databases, but few that are hit as actively.) We have over 3.5 million registered CodeCentral users, and have served more than 13 million downloads (we only count unique downloads by user, not repeats) since we started. In the last 365 days alone, we have served over 1.5 million unique downloads. When Sriram Balasubramanian told me that InterBase 2009 Update 3 could greatly increase my RAM cache for the database on my existing 64-bit server, I couldn't wait to try it. After reading about my experience, I'm sure you'll feel the same way! 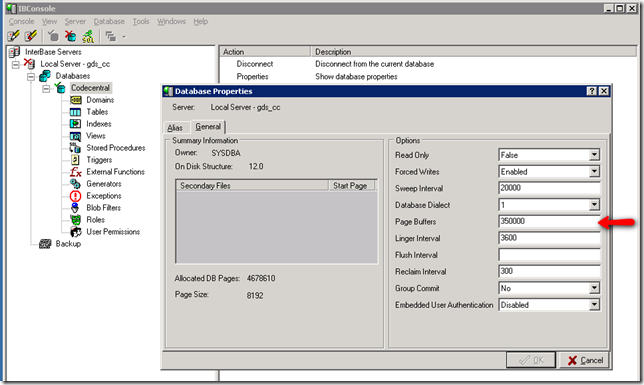 A few weeks ago, I replaced the InterBase 2007 instance running on our primary InterBase server machine (which has 4 InterBase instances on it) with InterBase 2009 Update 3, after successfully testing the new server with a CodeCentral backup running on a test Windows Server 2008 machine. We are now using 2.8GB of RAM for the CodeCentral database cache, and it's working very well. We definitely saw a performance improvement when the additional RAM cache came into play (sorry, I don't have specific numbers) and have had no problems with InterBase running in 64-bit mode. These three steps should take you a total of 10 minutes or less. You can modify the page buffers using either gfix or IBConsole. I used "localhost/gds_cc" to ensure I was talking to the correct instance of InterBase, because a buffers value of 350,000 is too high for InterBase 2007. The next time the database is freshly opened (first user accesses the database) the page buffer change will go into effect, and you'll have more RAM. InterBase 2009 Update 3 works great!